Some people can consistently eat fast food and still be skinny. But NO ONE can consistently eat fast food and still be healthy. 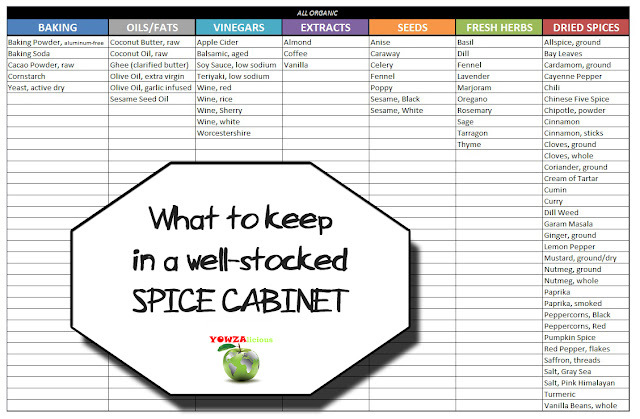 One of the keys to whipping up something quickly or at the last minute is to have a well-stocked spice cabinet. It's always so amazing to me when I realize that all it takes is a little dash of oregano to transport me to Italy...or a sprinkling of cumin to remind me of Mexico...or a special combo including smoked paprika and cinnamon to carry me to the Middle East. You can take a single vegetable -- like zucchini -- and just using spices, make hundreds of different dishes which taste nothing like each other! So, what is the key to a great spice cabinet? Well, first thing's first: organization! 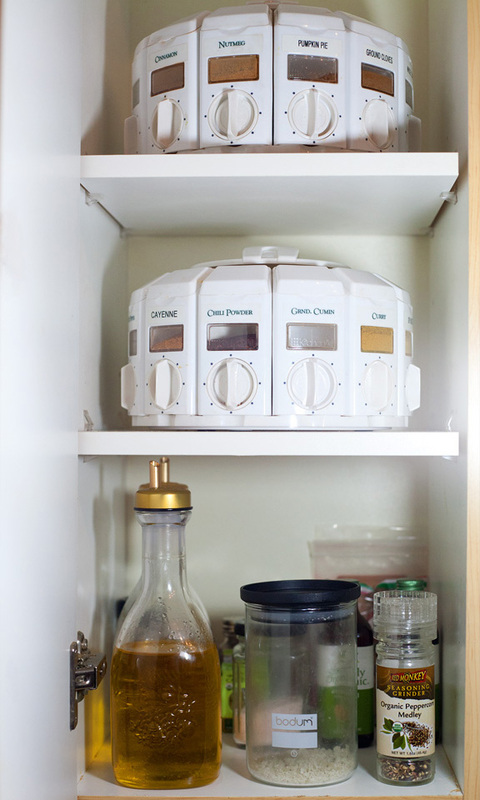 If you don't already have a "system" for your spices, I recommend investing in one. "But why can't I just leave my spices in the jars they came in?" Personally, I think revolving carousels provide for the easiest access. However, everyone's kitchen is different and everyone's tastes are different....so just figure out what will work best for you. I recommend purchasing a system which will hold at least 20 spices. I've had my carousels since my folks bought them for me in college (thanks mom & dad). If I were starting new, I would buy glass containers rather than plastic. OK, you have your system. What now? Well, if you're fortunate enough to live near a Whole Foods, Central Market, or a co-op...one of the great perks is being able to buy spices in the bulk section. And definitely buy ORGANIC whenever possible! Why spend the extra money on organic? Because with spices (more than almost anything else) it is important to make sure they haven't been sprayed with hundreds of gallons of pesticides, fungicides, and chemical fertilizers. There is no way to "wash" those things off of an herb or a spice. Furthermore, in the same way that dried herbs are more potent & concentrated than fresh herbs - the pesticides on them are as well. So please, look for organic options. There are certain spices you will likely use often: cumin, paprika, curry, cinnamon, etc. There are certain spices you will use less often: dry mustard, ground cardamom, fennel seed, etc. Buying your spices from the bulk section allows you to fill up to the brim on the commonly used spices and buy less of the infrequently used spices. Spices DO have an expiration date, so this way, you won't end up wasting a full jar of something you rarely use. Whenever I refill a spice container, I put a sticker on the side of it with the date - so I can reference it in the future to help determine that spice's freshness. Which spices should you buy? I keep my organic extra virgin olive oil, fresh organic black peppercorns, Himalayan Pink Salt & Grey Sea Salt on their own shelf. I use those 4 ingredients in almost everything I cook, so they needed to be in much larger containers. Also, I keep my fresh herbs vacuum-packed in the freezer to extend their life. Finally, be sure to keep your spices as far away from the stove *as is reasonable*. Obviously, you don't want them so far away that they are inconvenient to access! Just be aware that heat & moisture will affect the shelf-life of spices & dried herbs. Now you're all set! Go forth and cook!